One of my favorite things about crowfunding is gauging demand before production begins. Before Kickstarter, manufacturers had to make educated guesses about how many units to make in the first print run of a product. If you make too few, you lose the opportunity to maximize sales while the product is hot. If you make too many, you’ve overspent on a product you can’t sell. Or, worst-case scenario, hardly anyone wants your product at all. With crowdfunding, not only can you figure out if enough people want the product to justify a minimum print run, you can also gauge demand for the size of the initial print run with pinpoint accuracy. You can also use that information to figure out how many retail copies of the product you want to make (there is no set formula for determining that amount). 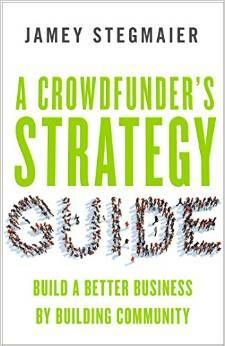 That isn’t to say I use crowdfunding to gauge demand for every print run, though. I prefer to use crowdfunding to create things that don’t already exist, as I see that as the best time to build community around the product, improve it with feedback and stretch goals, generate excitement for it, and raise funds. So this leads to some interesting situations after the first print run when I need a way to decide if there’s enough demand to justify another print run for some of the more niche products associated with the original Kickstarter. Just recently I started using a solution that I wanted to share with you. 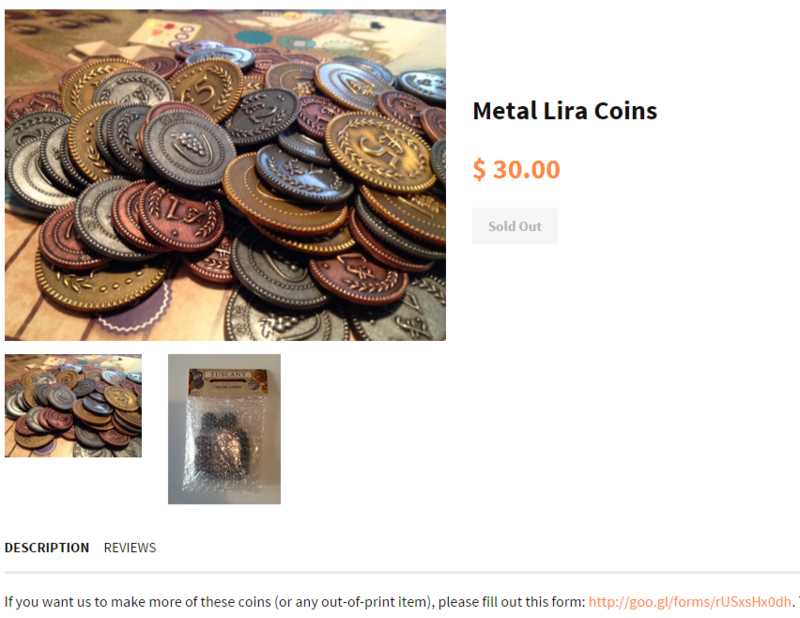 For example, as part of the Kickstarter campaign for Tuscany, we made custom metal lira coins. We included them in a version of Tuscany called Tuscany Prima, and we let people add them to their pledge. After the campaign, we sold them directly and through Meeplesource. It was an honest answer, though I wasn’t satisfied with it. I wasn’t really learning anything other than that it seemed like a few people wanted metal coins. And it didn’t feel like good customer service. So I finally decided to make a change. I created the Future Printing Request Form. It’s broken down into two sections: Products we’ve made in the past but are out of print or hard to get (just because we have Euphoria in stock in the US doesn’t mean stores in, say, Finland, are carrying it) and products we could make for the first time in the future. The form has been a HUGE help so far. While it only represents a tiny sliver of the board game market, at least it gives me some idea if the e-mails I get are indicative of greater demand for a specific product. Also, I try not to forget that it’s only a survey–people tend to be very forthcoming with their opinions up until the point that they actually have to spend money. I’ve been pleasantly surprised by category of products that could exist in the future. If someone has a clever idea for one of our games, I can now add it to the list to see if other people want the same thing. I did that the other day when someone suggested we make dual-layered recessed vineyard mats for Viticulture. Perhaps most importantly, it puts the power in the hand of the consumer. No longer do they have to wait helplessly for me to decide if we should make more coins. Whether they e-mail me or see on our website that the coins are sold out (see below), they have something they can do right now that will make a difference. Just click on the form and tell us what you want. What do you think about this concept? I’m sure other companies have used something similar in the past, but I couldn’t think of any examples for this entry. It’s a neat idea and with an engaged audience like yours it sounds very helpful. I just sold out of The King’s Armory (retail edition) and it’s the most exciting and depressing thing at the same time. : ) – The emails have started and I’m thinking… I don’t know either… will there be demand for a reprint? Will they sell fast enough to warrant the size of the run? Where will I store the extras till distribution calls on them 2-3 years down the road? In speaking with “my guy” we decided to try a “2nd Printing” with MINOR changes to the game (some art replacement, rule clarity, etc) together WITH an expansion. We’re collecting ideas for inclusion (new Hero / Monster ideas) on BGG. Will it all work? There’s no way to know… but Kickstarter will certainly help me gauge that demand. Gauging demand is the single-biggest reason why I pursued Kickstarter on two separate occasions…while I thought what I was making would be cool on people’s gaming tables, did anyone else think so? Well before launching the campaign, I solicited comments across the Arkham Horror forum…why? Because these were niche pieces and they wouldn’t be inexpensive…they were made in America by skilled artisans, not mass produced items from China. Yes, there was a premium on that type of artistic talent…but who would want them? When we decided to follow-up our successful campaign 18 months later, we still listened to both Backers and non-Backers, but we had the ability to weigh the responses in a more judicious fashion, as we had Backers from around the globe who already had our initial pieces in their possession. We had a sense (proved correct) that a higher percentage of previous Backers would be Backers on the next campaign…that was wonderful from a planning standpoint. In the end, it was the community of previous Backers that decided whether we should move forward…and we’re glad we listened to them! John: Have you thought about implementing a form like the one I mention here? At the very least, at least then you know specific people to whom you can send the Kickstarter. Joe: I have a high level of appreciation of this insight: “There’s a very wide gap between those who have an opinion and those who can afford to actually afford the pieces.” I totally agree. And you make a great point that the feedback is still invaluable, though it doesn’t necessarily speak to demand. You mentioned you could not think of a company that also does this. GMT Games is an example that creates a wait list for games, with the idea that they will republish once a target number of hopeful buyers has been hit. Dave: Awesome! Is that the GMT 500? I’ve heard that name (or something similar). Yes, the P500. It’s a little misleading as hitting 500 orders is neither necessary nor sufficient for a product to release, but you can assume that it will likely come out sometime if it does get the 500 (or 750). Sometimes the game hits 500 long before development is finished, other times production queue is full, development needs more time, etc. It’s a little like Kickstarter in that you have to make an order at a discount to get on the list – you can cancel between then and the possibly years-later release/billing, in which case of course you won’t be counted either.